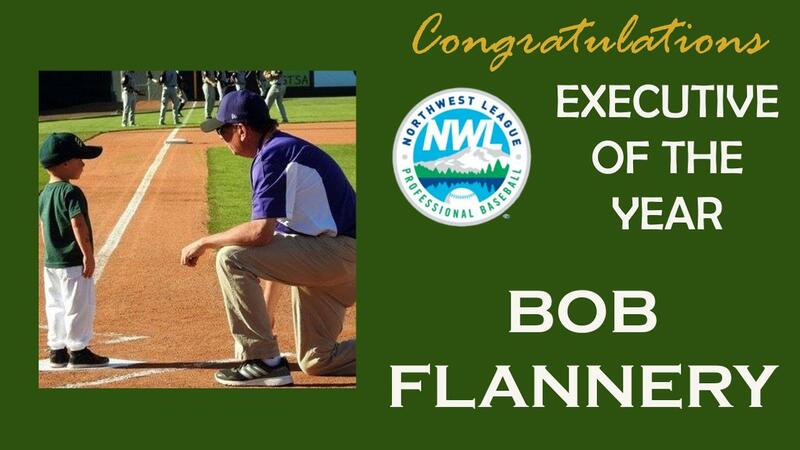 BOISE, ID: The Boise Hawks, in conjunction with the Northwest League, have announced that General Manager Bob Flannery has been named the Northwest League Executive of the Year, as voted by his peers. In 2018, the Hawks drew 126,192 fans; including 11 straight sellouts dating back to 2017. Since 2015, Flannery's first season as General Manager, the Hawks have seen a 44 percent increase in total attendance. "I am honored and humbled to be recognized by my peers in the league," said Flannery. "My name may be the only one on the award, but I know it is a total team effort by our staff to make this possible, and for that I am grateful to be associated with some of the best young minds in minor league baseball," Flannery added. The Hawks added their most robust promotional schedule to date that included 10 post-game firework shows, an appearance by Mr. Belding from Saved by the Bell, Military Appreciation Night and premium giveaway nights. Nightly promotions included Dog Day Sundays, Feed Your Face Mondays and Thirsty Thursdays. In the community, Hawks players and staff made over 50 local appearances, including the third annual Miracle League Game. This past August, the Hawks announced Boise will be the host city for the Northwest League / Pioneer League All-Star Game. The two-day event will bring in the best young stars of Minor League Baseball and highlight the city of Boise. The Hawks are the Treasure Valley's top stop for affordable, family entertainment. The Boise Hawks announced that they will be hosting the Northwest League / Pioneer League All Star Game in 2019. Deposits for all 2019 season seat plans (guaranteeing tickets to the 2019 Northwest League / Pioneer League All-Star Game) are currently being taken. To stay up to date on all things Boise Hawks, follow us on Facebook (www.facebook.com/boisehawksbaseball) or visit www.BoiseHawks.com.